Golden Ox Golden Cash is Ainsworth’s latest take on the classic Chinese-themed slot. This one is played using a 5 reel, 25 payline game engine and comes with some potentially tasty extras. They include streak respins and a free spins round. Play on all devices from between £1 and £40 per spin. There’s a strong Chinese feel to the reels which are dominated by red and gold. Joining the A to 9 royal values are firecrackers, fish and a money tree. The best paying symbols are the coins and the gold peach, both of which pay up to 8 times your total stake per payline. Golden Cash feature – this is triggered by landing 6 or more of the Golden Ox scatter on the same spin. Those Golden Ox symbols come with a cash value attached. This can range from 1 right up to 50 times your total stake. They lock in place and you’ll be awarded 3 respins. If another Golden Ox symbol lands, it too is held and the respins reset to 3. Once the respins are complete, all the cash values are added together and that’s the prize you’ll win. If you fill all of the reels with Golden Ox symbols, you’ll win the Grand Jackpot prize of £30,000! Extra Bonus Golden Cash feature – this round can trigger at random on any spin. A giant Golden Ox symbol will fill the whole of the middle 3 reels. You’ll then receive 3 respins. Once again, any Golden Ox symbols that land reset the respins to 3. All the cash values are totted up once the respins are done. Free Games feature – land 3 of the Free Games scatter and you’ll receive 8 free spins. A new paytable is in play here which offers bigger rewards than the base game. Look out too for the Fortune Bonus symbol. Land 4 or 5, 6 or 7 or 8 or 9 of these and you’ll win the Mini, Minor or Major Bonus. We’ve often found slots from Ainsworth to be pretty vanilla both in terms of design and gameplay. The visuals here are certainly a step up from the developer’s more tired looking games and the features offer some very decent potential. 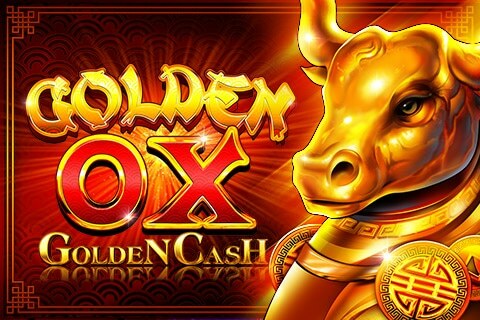 Add the quartet of jackpots into the mix and Golden Ox Golden Cash becomes a very playable take on the Chinese-themed slot. Saying that, I would much rather play more modern offerings like Blueprint Gaming’s Primal MegaWays.